Tartan Community Builders - We are truly grateful for all of the time and energy each parent gives to St. Thomas Aquinas Parish School. Please know that for the remainder of the year, we will be using SignUp.com, formerly VolunteerSpot.org for all of the events that are happening here at St. Thomas Aquinas Parish School. Sign-up for any of our events, please click the image below to access the "All School Events". Additionally, you can click on the links for the classroom parities to access your students class to see if they may need additional help for their party. Thank you again for all of your time and assistance in making St. Thomas Aquinas Parish School great! St. Thomas Aquinas Parish School is committed to providing a safe environment for all of our children. Therefore, we abide by the Safe Environment: Protecting God’ Children policies put forth by the U.S. Bishops in 2002. These policies mandate the Diocese of Lansing requirement that all adults 18 years and older who interact with minors are required to complete a Protecting God’s Children (VIRTUS) training session, to complete the Diocese of Lansing Employee and Volunteer Criminal Background Check Disclosure and Authorization form, and to have read and signed the Catholic Diocese of Lansing Code of Conduct for Clergy, Employees and Volunteers form before working or volunteering in any capacity with our students. These forms are available at the school office or by clicking on the link above. The Protecting God’s Children (VIRTUS) training workshop, which includes videos and facilitated discussions, educates and trains adults (clergy, religious teachers, staff, coaches, parents, and volunteers) about the warning signs of child sexual abuse, ways to help prevent this abuse, methods of properly reporting suspicions of abuse, and responding to allegations of abuse. This crucial information will empower each adult to rise to the challenge of protecting all of God’s children. Training sessions are offered throughout the year at various locations within the Diocese of Lansing. You can view the upcoming training schedule and pre-register for a training session at www.virtus.org. The local Protecting God’s Children training facilitators are flexible. If you do not see an upcoming training that will work with your schedule, or if you have any questions at all, please contact Heather Carrigan, STA School Safe Environment Coordinator at 517-482-8016 or stavirtus@elcatholics.org. Volunteers are instrumental in making St. Thomas Aquinas Parish School the excellent program that it is. Thank you in advance for sharing your time and talent with the school community and for your commitment to protecting all of God’s children. We&apos;re using SignUp.com to organize our PLAYGROUND VOLUNTEER CALENDAR for 2018-2019. Please sign up for 4 dates as a Playground Volunteer at St. Thomas Aquinas School! 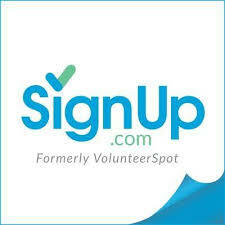 Please Note: SignUp.com (formerly VolunteerSpot) does not share your email address with anyone.